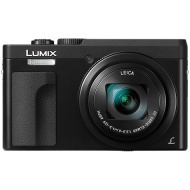 alaTest has collected and analyzed 12 reviews of Panasonic LUMIX DMC-TZ90 Super Zoom Digital Camera, 4K Ultra HD, 20.3MP, 30x Optical Zoom, Wi-Fi, EVF, 3" LCD Tiltable Touch Screen. The average rating for this product is 4.8/5, compared to an average rating of 4.0/5 for other Camcorders for all reviews. Reviewers are impressed by the image quality and durability. The zoom and usability are also mentioned favorably, but many are negative about the reliability.